Sepia Saturday – where we are inspired to use old photographs for new reflections. I found this photo while hatching a cunning (up till now secret) plan for an adventure for Mr ImagesPast and me. It’s wheeled transport of a sort, only dog-propelled. 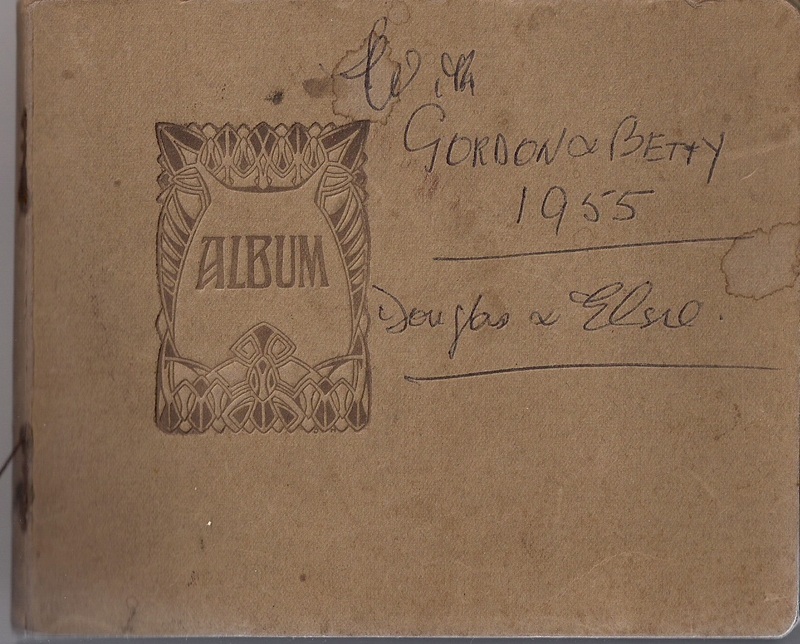 Douglas and Elsie were my Mum’s parents and Gordon was Douglas’s brother. 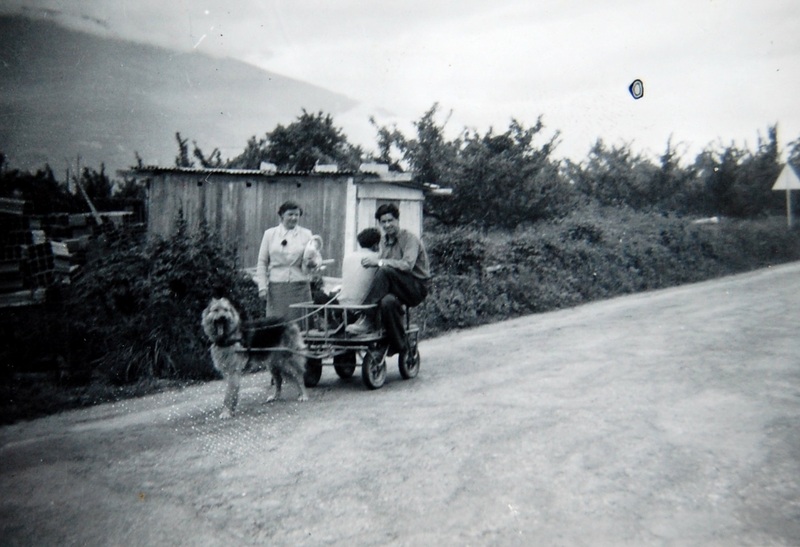 Along with Douglas’s sister-in-law Betty, they went on an epic road trip from Scotland around parts of Europe in May/June 1955, which is almost 60 years ago. Time to celebrate their Diamond Anniversary of their holiday. Here’s a photo that I haven’t identified yet, so there’s a bit of research to be done while I have the map out trying to follow their route. My brilliant idea is to recreate said road trip (and photos) as a surprise and I’m looking forward to Mr ImagesPast’s reaction which, I am sure, will be huge excitement followed by a packing spree. It will also be a way of him justifying the bespoke luggage he recently ordered to fit in the boot of his car. 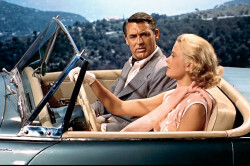 We will, of course, need to take his car to fit in with the idea of me as Grace Kelly. Oh, now, there’s another thought, what a lovely souvenir a diamond or two would make. Zoom off to Sepia Saturday to see where everyone else is going. This entry was posted in Douglas & Elsie's 1955 Road Trip, Photos, Sepia Saturday, Silly Girl's Project and tagged Monte Carlo, old photos, Sepia Saturday, Silly Girl's Project. Bookmark the permalink. 18 Responses to Dog cart. What on earth does this have to do with Grace Kelly? At first I thought you were thinking of re-creating the road trip IN the dg cart! I look forward to seeing your impression of Grace Kelly. The photograph of the stone falcon statue seems very un-Scottish, and I’ll be intrigued to hear if you discover where it is or was. I hope you’ll share the photos of your own re-creation of this road trip. I’ve often thought about doing this sort of thing, and even did this for a trip that my Dutch grandparents made through Belgium and France by bicycle and train in the 1920s, when they visited her brother’s grave on the Western Front. 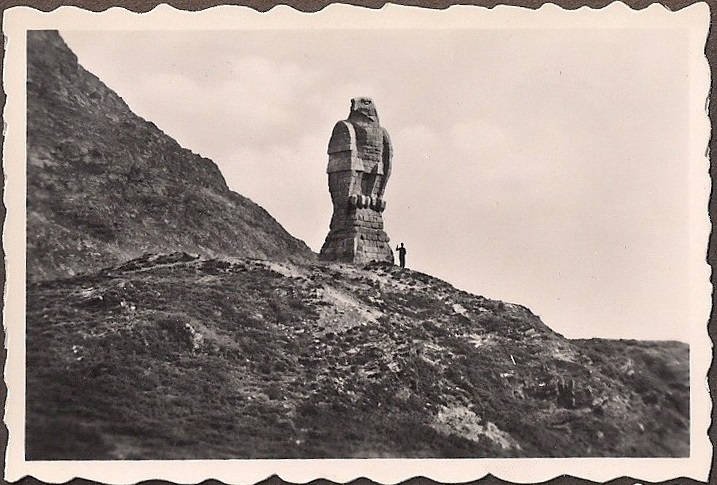 They didn’t seem to take any pictures in the UK – the statue is the Simplon Eagle in Switzerland – Google image search found it for me 🙂 I hope that the pics from the trip will make a good blog series. We intend to have a lot of fun en route! Oh well done, Jo. I’m sure that the trip will be entertaining, both for you and us. I followed my great grandfather’s route as close as possible when he traveled by train and carriage from Sacramento to Yosemite National Park with a side trip to see the Big Trees east of Murphy’s in 1874, & I had so much fun doing it – taking ‘now’ pictures all along the way. Then I went to museums and libraries in the area to find ‘old’ pictures of the same route to compare with my ‘now’ pix and eventually presented a program to a local history club. It was quite an adventure – both for him AND for me! And by the way, I noticed the picture of Grace Kelly & what’s his name was courtesy of —–Orinda Theatre. I noticed because my mom now lives in Orinda – still a quaint little town surrounded by modern growth. I like the idea of going to local museums and libraries. I need to brush up on my French and learn some German and Flemish in a hurry then! The dog and cart image is a great one — the dog looks well pleased to have his photo taken — and I’d love to see the stone eagle up close. Looking forward to seeing your Grace-esque re-creation. Given the bespoke luggage, diamonds for the trip seem completely reasonable, as does a new frock and perhaps a silk scarf too. Would Mr. ImagesPast wear an ascot? I hope you have a great time en route! I hate to admit it, but the best part of that post was the still from the film clip — I saw that movie! I remember thinking that there wasn’t enough wind whipping her hair; my first awareness at Hollywood fake takes! One might say that, once you go on your adventure, you’ll be gone with the wind, and back with the breeze. Safe trip!! Sounds like a great trip and lots of fun recreating the original. I hope you pose for photos in like fashion as well. It is fun that you can recreate some of it and know what they were doing back then. I would happily send you the petrol money but it would not be safe to send money through the post so I will send the petrol instead. You will recognise the letter when it arrives – it will have an unmistakeable petrolly aroma. Great photos – the foundation for a great trip.